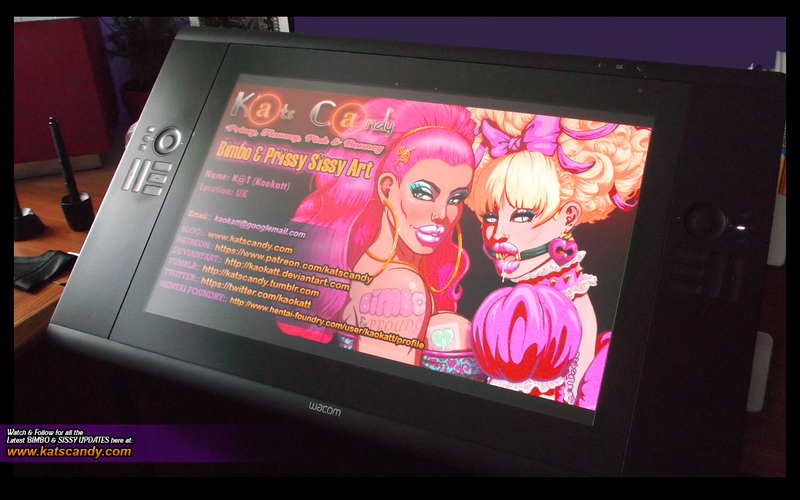 KatsCandy.com Bimbo and Prissy Sissy Art: WACOM CINTIQ 24HD REVIEW: My Personal Impressions of the Wacom Cintiq 24HD. 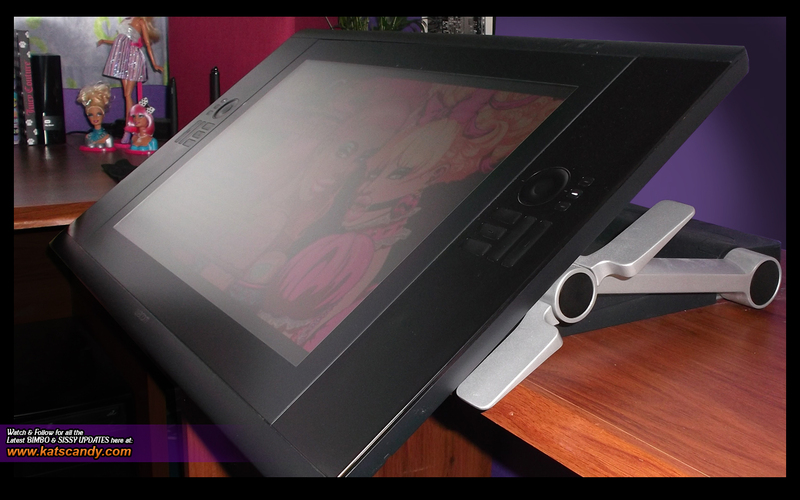 WACOM CINTIQ 24HD REVIEW: My Personal Impressions of the Wacom Cintiq 24HD. I have been running the Cintiq 24HD on Windows 7 (64 Bit) and predominantly using Adobe Photoshop CS6, and I am still curious to try Illustrator with the Cintiq given the advantages of freehand drawing with the Cintiq. For many people the maximum screen resolution being 1920x1200 is an issue (especially to those that use high resolution Apple Tablets) as well as the initial colour settings when turning on the cintiq for the first time. And so I ignored all those that said, the hand obscurity when working on the Cintiq can be off putting, (since in most cases this message came from artists who preferred working directly onto the standard non-Cintiq tablets). I have found so far that, that the hand-blocking notion is both true & false… Initially I was very aware that there could be a level of obscurity and so at first it felt like there was some obscurity with my hand there which I was also perhaps more aware of due to working straight onto a screen instead of a normal piece of paper. What is a little obscuring is the thickness of the pen which comes with the Cintiq and then add to that your own hand when holding it. As obviously the traditional Wacom pens tend to have a reasonably thick grip and so when holding that handle it does block your line of sight a little more than it would with a standard pen or pencil. BUT this visual aspect is actually helped by the 0.5cm thick plastic perspects that separates the Cintiq’s working surface from the actual screen and allows the user to gain a slight bit more unobstructed visual working area. 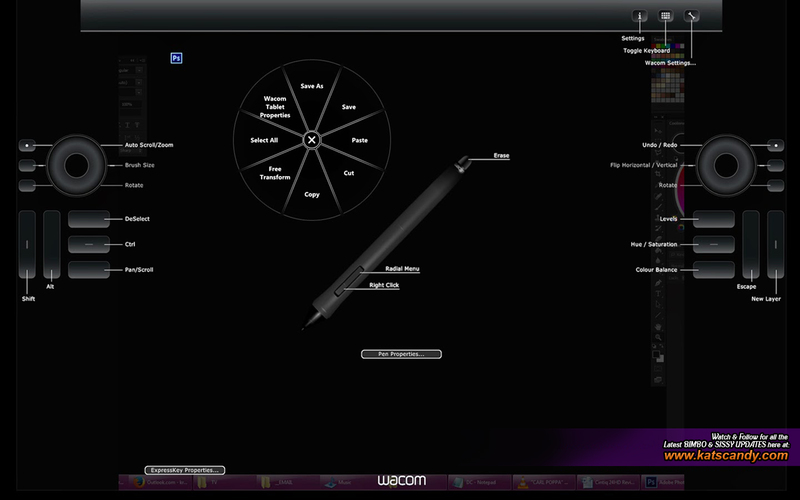 I have since Purchased a Thinner Wacom Pen Model to use on the Cintiq. WHAT ABOUT THE CINTIQ 24HD TOUCH? When considering this purchase a little part of me was curious about the HD Touch Version as one would think that it would allow greater use of things like the rotate & zoom functions. I had read & watched numerous reviews with about 95% of the people commenting within their reviews saying that if given the choice again they would purchase the standard 24HD model instead. Especially now that the 24HD touch is not completely compatible with some of adobes latest program’s/ updates and so for that reason I decided against it, and I can safely say I am so glad I did. So far I haven’t come across a single instance when the touch rings have not provided the ample control & function needed. 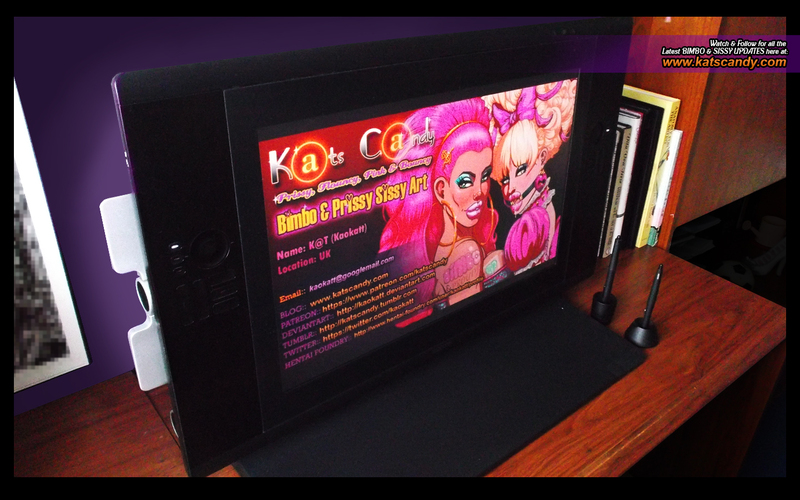 Since the Wacom Cintiq 24HD is essentially a Touchscreen Monitor & not a Stand Alone PC it does mean that in order to run 2 monitors you need to make sure that you have a Duel Monitor Connector slot on the back of your PC. The Cintiq does come with DVI & VGA cables if you perhaps only have one DVI & one VGA port (as I do), initially I was kind of put off by this, as I plugged the Cintiq into the DVI slot & my Standard Monitor into the VGA slot. I could see the slight difference in the colour richness on my standard monitor when I plugged it into the VGA slot instead of the DVI. But ultimately its been fine, as that slightly loss of colour richness & image clarity is not as crucial for me now that I use the Cintiq as my Primary Working Monitor. *) SUPER EASY TO INSTALL AND VERY NATURAL TO USE. 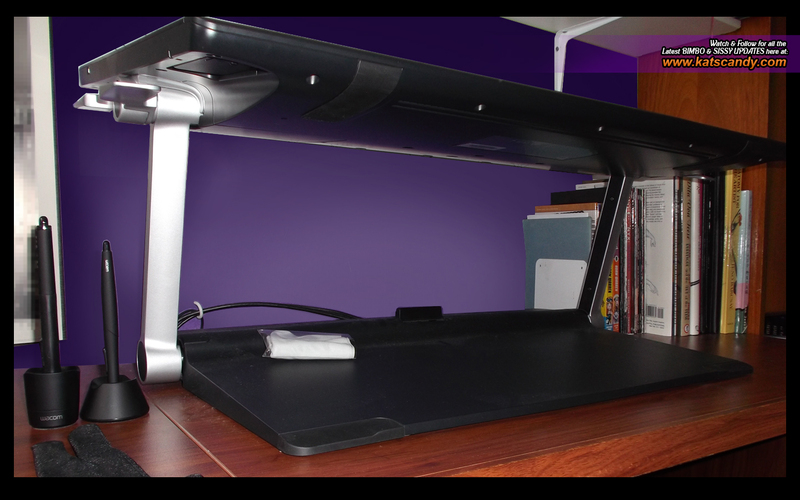 *) VERY STURDY & SLEEK, even more so than I had expected, The screen & arms rotate with ease all the while taking all the weight and strain from the huge 24 inch display, allowing you as the user to casually lift & rotate the screen as needed. *) In addition because of the Monitors rotation & locking system whenever you need to stretch your legs you can just lift the monitor up & work standing up. *) The Visual Calibration of the cursor seems to compensate very well when going from one side of the screen to the other… (As the users visual perception changes as the viewed angle of hand movement alters from ‘center to left’ & from ‘center to right’). *) The Touch Rings and Express Keys are so easy to program and use, I expected them to take me hours to assign, but had them done in 15-20 minutes after turning on the cintiq for the first time. *) It feels sooooooo much more satisfying to colour and seeing it happen beneath the pen instead of as a disembodied cursor on the screen. *) The Cintiq 24HD comes with 11 Free Pen Tips/ Nibs. - x3 Felt Nibs – I think they are felt nibs, to me they feel like really super hard compressed paper or card & they are actually my favourite nibs as they offer a slight bit of resistance & texture when working on the cintiq's screen which makes the movements feel that slight bit more traditional. - x1 Stroke Nib – This nib kind of Feels like a brush, it has a spring half way down the nib which softener’s the users line-stroke. - x7 Standard Plastic Nibs – These just feel like you standard Wacom nibs, smooth, solid and like you would expect the Wacom tips to feel if you have previously used a Wacom tablet or pad. - By going into the ‘services’ menu in windows & restarting the driver, these 2 options do fix that issue. (Since writing this post, I have Reinstalled JUST the ORIGINAL DRIVERS which came with the Cintiq (and None of the Updates) and its Been Absolutely Fine). *) So far I have only had one very, very minor issue that has slightly arisen. It’s the same sort of issue that occurs with the standard tablets. After prolonged use they tend to have a build up of plastic on plastic when drawing onto the tablets which causes slight areas that I can only describe as smooth but a wax-like texture friction. There are certain areas of the screen where I work more than others and in just a few days I have already noticed a slight change in the screen texture that now doesn’t quite have the silky smoothness of the rest of the monitor. *) The Little Plastic spring-mounted Support legs that flick down at the base of the Cintiq feel so fragile & weak that I haven’t yet dared to use them while working on the Cintiq, in-fact they are the only part of this beautiful tablet that feels like it was a cheap after-thought. *) The Pen tips wear down Very Quickly, My previous little 6x4 Wacom pads pen tip lasted over 10 years... and in the space of 3-4 months I have already gone through 2 Wacom pen tips, one of the black plastic & one of the textured tips. None of the Negatives I have mentioned in any way have swayed my love for this beautiful piece of hardware/ equipment. I have found with Photoshop especially I have been able to create brushes to duplicate the feel of drawing on paper, and to be honest, I didn’t even realise I had begun to transition into solely working straight onto the Cintiq until this past week when I went to do an annual shop & re-stock on art supplies & paper & realised that I hadn’t really even been using any paper for the past few months (aside from a couple of small sketchbook doodles), as even my sketchbook work has begun transitioning to the Cintiq. 3) The one thing that has been apparent, is that I have been able to really play around with the way I colour, and even though I don’t in any way consider myself a good colourist, I have been very happy with the way that the Cintiq 24hd has allowed me to gain a much greater grasp with applying & mixing colours, textures & generally manipulating an image to become something that much closer to what I would like it to be. 01) SCREEN PROTECTOR SHEET - I would highly recommend purchasing a Screen Protector sheet, It not only helps generally improve the longer life & smoothness of your screen, it may also help you the user to let go & treat the screen a bit more like a piece of paper that You can apply pressure to with the pen etc without worrying about causing the perspect’s screen layer to become textured with that plastic-wax feel. 02) SMUDGE GUARD GLOVE - Secondly I would also highly recommend using a Glove/ Smudge Guard to help allow your hand to move smoothly over the screen without causing any friction from your hands natural sweat or oils. Also I can't wait to hear about your new comic/project! I really could not have imagined how much the Cintiq would help me being able to convert my traditional work style into the digital medium. Especially when compared to the old standard wacom tablet I had before, I never realised just how much working on that old tablet held me back (in a manner of speaking). I am not saying that with the Cintiq I am now suddenly a fabulous artist, far from it.. But I am now enjoying my art a lot more than I ever was when having to work on my old tablet.